When nine-year-old Bud accidentally catches the wrong bus and finds himself launched into a far-away galaxy, making friends is the least of his problems! 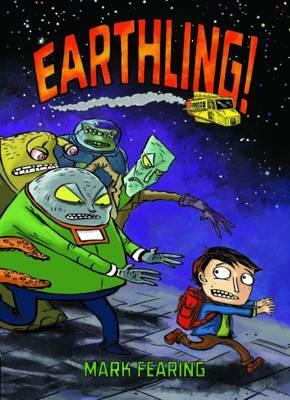 At Cosmos Academy, Bud soon learns that Earthlings are the most feared creatures in the galaxy. But with the help of his new friend, Gort, Bud hides his true identity and even learns to play anti-gravity Zero-Ball (when he's only ever been good at watching sports). But with paranoid Principal Lepton threatening to expel any Earthlings, and nothing more than Gort's Blip-computer to determine Earth's coordinates, Bud may be lost in space forever! Both gripping and hilarious, this dynamic graphic novel is perfect for kids who crave adventure with a sense of humor. Mark Fearing is an awardwinning illustrator, cartoonist and animator. He lives in Portland, Oregon, with his wife, daughter, two dogs, and a cat.